Ohio’s water resources support a complex web of human activities and nature—clean and abundant water is needed for drinking, recreation, farming, and industry, as well as for fish and wildlife needs. Although rainfall in normal years can support these activities and needs, occasional floods and droughts can disrupt streamflow, groundwater, water availability, water quality, recreation, and aquatic habitats. Ohio is bordered by the Ohio River and Lake Erie; it has over 44,000 miles of streams and more than 60,000 lakes and ponds. Nearly all the rural population obtain drinking water from groundwater sources. The U.S. Geological Survey (USGS) works in cooperation with local, State, and other Federal agencies, as well as universities, to furnish decision makers, policy makers, USGS scientists, and the general public with reliable scientific information and tools to assist them in management, stewardship, and use of Ohio’s natural resources. The diversity of scientific expertise among USGS personnel enables them to carry out large- and small-scale multidisciplinary studies. The USGS is unique among government organizations because it has neither regulatory nor developmental authority—its sole product is impartial, credible, relevant, and timely scientific information, equally accessible and available to everyone. The USGS Ohio Water Science Center provides reliable hydrologic and water-related ecological information to aid in the understanding of the use and management of the Nation’s water resources, in general, and Ohio’s water resources, in particular. This fact sheet provides an overview of current (2014) or recently completed USGS studies and data activities pertaining to water resources in Ohio. More information regarding projects of the USGS Ohio Water Science Center is available at http://oh.water.usgs.gov/. 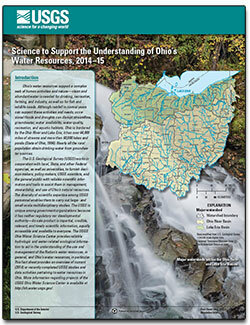 Shaffer, K.H., and Kula, S.P., comp., 2014, Science to support the understanding of Ohio's water resources, 2014–15: U.S. Geological Survey Fact Sheet 2014–3097, 6 p., https://dx.doi.org/10.3133/fs20143097.